What are the most common mistakes IT managers make when doing a server virtualization project? There are many, and they’re easily avoidable, said a gaggle of Gartner analysts at the Gartner Data Center Conference in Las Vegas this week. Most virtualization goofs center around lack of planning and forethought, they said. Similarly, most virtualization newbies don’t anticipate the increase in demand that virtualization will place on their systems, nor the speed at which growth will occur. “Virtualization introduces speed, and most processes aren’t ready for speed,” said Tom Bittman, another Gartner research VP. And because virtualization tends to remove artificial obstacles to provisioning new workloads, demand for services tends to double in highly virtualized environments, he said. To avoid being overwhelmed, newcomers to virtualization should consider implementing lifecycle management, as well as chargeback or showback. Other rookie mistakes involve failing to treat the virtualization layer with enough gravitas. In their enthusiasm for VMware, many IT managers make the mistake of moving too quickly to the latest and greatest release of the platform, said Passmore, oftentimes before ecosystem such as backup and management software are available. And security of the virtualization layer is often overlooked, added Neil MacDonald, vice president and distinguished analyst. “These issues are overlooked because people say ‘nothing’s different,’ when really, a lot is different,” he said. To avoid security problems, MacDonald suggested IT managers elevate virtualization to the same layer as the operating system. “Treat it like an OS,” he said, with all the attending hardening, patch management and compliance processes. This week at the Gartner Data Center conference in Las Vegas, analysts warned IT managers to avoid inadvertently backing into any vendor’s integrated stack. For converged infrastructure platforms, “it’s too early, there are too many unknowns, and it will not serve you well over the long haul,” said Gartner VP David Capuccio in the Monday morning keynote. Gartner’s Jeff Hewitt dubbed the converged infrastructure players The Big Five: Cisco, Dell, HP, IBM and Oracle. These vendors already have a piece of your data center budget, and are looking for more, acquiring companies or partnering to create an integrated stack. Some IT managers are calling these converged systems the new mainframes: servers, storage, networking, operating systems, hypervisor, management tools and middleware all pre-integrated, and each layer of the stack is optimized with the vendor’s secret sauce. Examples include the Cisco UCS, Oracle’s Exadata and Exalogic machines, HP’s Bladesystem Matrix and VCE’s vBlock. These machines can put up impressive performance numbers, and make vendor management simpler, but analysts and IT managers are wary of vendor lock-in. “When you reduce your number of suppliers, you inherently increase risk and make it harder to switch providers, and you reduce your negotiation strength,” Hewitt said. Gartner asked attendees: Which of the Big Five are you likely to buy from in 2011 that you’re not buying from today? Cisco dominated with 33%, followed by HP 18%, IBM 17%, Dell 9%, and Oracle with 8%. Also, 15% said they didn’t plan to buy anything new from the big five. “Cisco offering its network customers UCS is as easy of McDonalds offering fries with hamburger,” Hewitt said. In a twist on blade server design, Fujitsu announced a new blade server enclosure today that can, in a pinch, be turned 90 degrees and rolled under a desk. The new PRIMERGY BX400 is the little brother to the 10U BX900, and is designed for two scenarios. 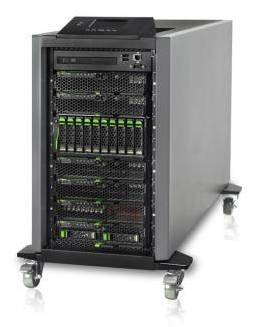 Like most blade enclosures, the BX400 can be deployed in a traditional data center. Alternately, for organizations with limited space and a low tolerance for noise, the BX400 can be equipped with a floor stand kit that tips it on its side, and then placed in an office or retail location. “It’s extremely easy to use in existing environments, with no power or cooling modifications,” said Manual Martull, Fujitsu senior director of marketing. Characteristics of the BX400 that make it suitable outside of the data center include low power consumption and low noise emmissions (45 decibels) relative to other blades. The floor standing variant also comes with a top-mount LCD module, and a lockable front door. In other respects, the BX4000 is a relatively normal blade enclosure designed for shops that want to centralize and simplify their IT resources. The 6U enclosure can up equipped with a total of eight two-socket Intel Xeon 5500 and 5600 server blades and ten-drive SX960 or SX940 storage blades. In addition, customers can opt for a centralized shared storage option in PRIMERGY VSX, a version of NetApp’s Data ONTAP-v storage software that runs as a virtual appliance on a dedicated blade. It’s that combination — centralized shared storage plus suitability for non-data center environments – that Martull said Fujitsu hopes will help it penetrate small to medium businesses. He said these so-called SMBs represent the biggest growth area for blades. But if a tree falls in a forest and no one is around to hear it, does it make a noise? Fujitsu’s presence in North America at least is tiny, Martull admitted, with about 1% of market share. “Our challenge in North America has been brand awareness, and competing against other strong American brands,” he said. In the coming year, look to Fujitsu to grow its North American sales team, and expand its midmarket channel presence through distributors like Tech Data and CDW. The commercial entity behind Cfengine, a popular open source data center automation and configuration tool, recently rolled out a new version of its proprietary offering Cfengine Nova 2.0. Cfengine has been around since the early 1990s, and boasts some large customers, including companies such as eBay and Google, and is trying now to capitalize on its customer base by converting users to the pay-version. Free open source systems management tools typically aren’t as automated or easy to understand as their commercial counterparts, so companies need to have a fairly skilled systems admins on staff to make them work. Also many of the proprietary version of these tools include virtualization-specific features, not included in the free versions. Open source systems management vendors have a lot of levers they can use to convince a data center manager to buy the proprietary or supported version of their software. But you might not think geography would factor into that decision making process. That is, unless you’re James Genus, System Administrator at Bigelow Laboratory for Ocean Sciences, located in coastal Maine. The lab’s primary research focus is on the biological productivity in the world’s oceans and it supports genomic sequencing of single cell organisms, which requires some hefty compute power. Bigelow recently moved from the open source version of CFengine to its commercial counterpart, CFengine Nova. And according to Genus, the lab’s location was a big factor in that decision. Researchers are drawn to remote locations like Maine’s Boothbay Harbor, to get away from society and bureaucracy, to get things done, Genus said. But operating in a very isolated location has its risks. Power can go out for three weeks after an ice storm, and self-sufficiency is important. Genus said he’s heard about CFengine’s competitors in the open source space, Puppet and Chef, but has not looked at them in detail. He said he’s happy about the tool’s ability to scale well. Which is a good thing, since the lab’s environment is about to get a lot bigger in the next couple years. Genus said Bigelow has plans to build a new mobile data center pod: 22 racks at 50U each, which once virtualized will scale to 3,000 potential nodes. Check out our Open Source Systems Management tool slideshow for more info. Intel and a group of high profile data center managers are banding together to drive cloud computing standards and interoperability. The organization, called the Open Data Center Alliance, boasts a handful of really big names, including BMW, Shell, JP Morgan Chase, and Lockheed Martin. Andrew Feig, executive director in the infrastructure group at global financial services firm UBS is on the new organization’s steering committee. He said his motivation to participate is to get better utilization out of IT infrastructure. “Every six months we’re getting more powerful servers and without a cloud model these efficiency gains will go out the window,” Feig said. “If you have one app running on a four year old server, and move it to a brand new server, your utilization goes from 10% to 2% on the new machine. You have to virtualize, but that’s only the first step. Feig said UBS is currently building out its internal private cloud capabilities, “But we don’t want a big integration curve if we want to look outside.” Feig said. “We’re looking for more standards to allow us to consume [public cloud]. Right now it’s a difficult meal to eat. Early adopters get locked in, and there is big pain switching later. Cloud vendor interoperability is one of the major agenda items for the Open Data Center Alliance. Developing a standard to switch from one cloud vendor to another seamlessly isn’t going to be easy. But money talks. Intel is the organizing force behind the group as a non-voting technical advisor. The Open Data Center Alliance will offer its first public roadmap in Q1 2011. With Hewlett-Packard, Cisco and others preaching the benefits of converged data center infrastructure–packaging up compute server, networking and storage together–certifications for IT pros had to follow. BMC recently released a new version of its job scheduler, Control-M 7, with new features to help manage IT workloads in the cloud. The software has come a long way from prioritizing and scheduling batch computing jobs on the mainframe a few decades ago. Modern job scheduling tools run in the distributed, virtualized and now cloud computing environments. And vendors started rebranding job schedulers as “workload automation” to make it sound more exciting. John Strege, director of capacity and enterprise software at the Chicago Board of Options Exchange, said his organization has used Control-M for over a decade for mainframe batch processing. Today he’s using Control M to start up and shut down the Unix boxes in CBOE’s QA certification tier, which is basically a mirror of the exchange’s production trading system. BMC execs said for this Control-M release, the company worked hard to streamline the inline install and upgrade process. According to BMC, users are reporting reduced time and effort by about 90%. This is good news for users who have complained in the past about systems management software updates from the Big Four spanning months or even years, and requiring an army of professional services people to get the job done. Strege said the simplified update process could be a driver for CBOE to upgrade sooner. But this update is going to be a bit more complex than previous projects. “We’ve been running Control-M for Solaris 10 on SPARC servers, and we’ll probably go to Linux on x86 for the next update,” Strege said. “We’ve been planning to go with x86 servers for a lot of our applications for over a year now. And for some of them we’re sticking with Solaris on x86. But in the case of a lot of BMC products, they don’t support Solaris on x86, so Linux is our only choice for a lot of these packages.